Like many of the insights we pulled from other industries earlier that day, there are great parallels between customer experience in the airline industry and healthcare. 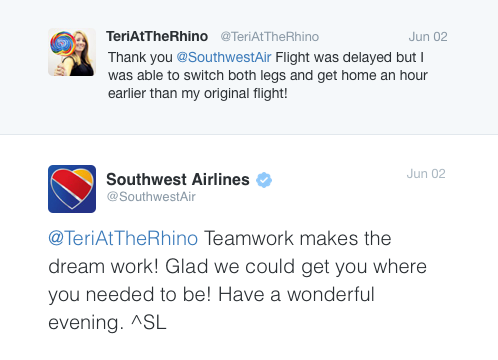 As Southwest so eloquently pointed out, a positive customer experience takes teamwork. It’s a well-coordinated effort that spans departments, roles – and even technology platforms. You see, it wasn’t just the notification I received that my flight was delayed. Or the friendliness of the booking agents that helped me. It wasn’t only that I could switch my flights without any fees. Not even the speed of Southwest’s response on Twitter. Or their perfectly clever reply. It was ALL those things combined that gave me a newfound loyalty for Southwest – something that I may not have necessarily felt if I had only encountered one of those benefits. So while it’s easy to get caught up in very specific tactics (like transparency of quality data), Southwest provides a thoughtful reminder that we need to step back and think about the greater orchestration of customer experience. Neuroscience tells us that our brains use past memories to determine if we should trust something (say a hospital you’d like to schedule an appointment with). One of the best ways hospitals can understand how to create moments of trust with consumers is to ask them. What do they care about? What’s important to them? Not only in a provider, but what’s important to their health? What’s important in their lives? And because consumer health is a life-long journey that changes over time, it’s important to look at consumer profiles at different parts of their journey. Customer Journey Mapping is a great way to look at what’s important to consumers long before they become a patient to well after they are back on their feet and healthy again. It helps reveal the micro-moments in which you can build trust – and avoid distrust. 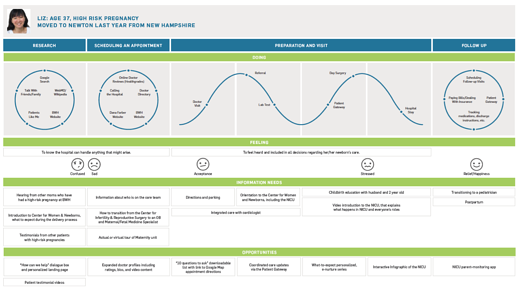 In this journey map that White Rhino developed for one of Boston’s leading academic hospitals, we were able to see that a mom expecting her second child – and categorized as high-risk – will visit the OBGYN webpage with very different emotions than a first-time mom. This mom isn’t looking for tips on how to manage morning sickness. Instead, she is looking for comfort that she will be in good hands. And every piece of content that assumes she is a healthy first-time mom, makes her feel like the hospital doesn’t “get her” or has what she needs. This moment of distrust that our journey mapping identified led to the development of new video content for the hospital. Now, high-risk moms can get to know the doctors and nurses that will be by their side. Another strategy coming out of this process was the implementation of a “site helper” for OBGYN and other specialties – from cardiology to oncology – that builds trust by quickly getting visitors to content that aligns with their unique questions and concerns. I’ve heard countless hospital mission statements about “delivering the best patient care possible.” But if there’s a healthcare organization out there that does not want to deliver great patient care, then we have a serious problem. Southwest focuses on the friendliness of its people, which attracts equally friendly customers that appreciate a beyond-nice flight staff and Southwest’s no-frills flight experience. JetBlue, on the other hand, puts a pleasant flight experience first with great selection of free snacks, free entertainment, and free Wi-Fi. Of course, a courteous flight staff is still part of the JetBlue experience. But the way it’s delivered within the context of everything else they do is starkly different from Southwest. In the healthcare industry, brand differentiation is an essential strategy in highly competitive areas like Boston. Take, for instance, Nantucket Cottage Hospital – the only hospital on a small island off the coast of Massachusetts that was increasingly seeing patients choose off-island care on Cape Cod and in Boston. Now it’s time to put everything together. Go back to your Customer Journey Map and brainstorm how your brand essence can come to life to build trust across the customer experience. In the case of Nantucket, their brand positioning was infused into a digital roadmap. Short term initiatives included a newly designed website that re-invented how visitors navigate the site and helps prospective patients form a closer relationship with island doctors through bios that feel more like stories than resumes. 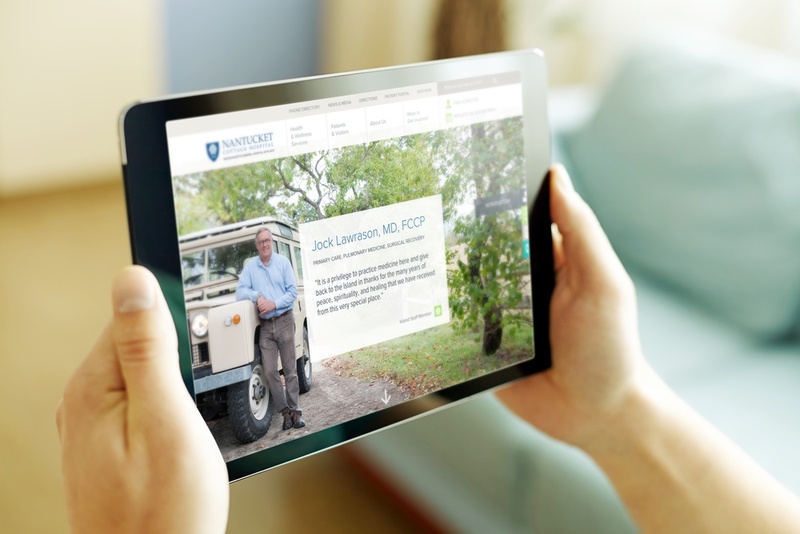 Within the first 3 months of launching its new brand positioning and user-centric website, Nantucket has seen a 300% increase in online appointment requests. To build on this success, the Nantucket digital plan also includes long-term strategies including the creation of custom wellness apps to engage consumers when they’re healthy, not just when they’re sick. When building your own digital plan, don’t forget to think cross-functionally. Beyond your marketing, consider how your brand essence impacts the way you approach population health. How does it impact the technology decisions you make such as which EHR vendor you choose? Or the way you hire and train your doctors. At Mayo Clinic the brand mission “the needs of the patient come first” permeates all the way down to paying its doctors on salary rather than incentives and productivity goals. And, because becoming more consumer-centric is a journey in itself, consider how you will build this customer experience over time. We like to look 1, 3, and 5 years out, reassessing the roadmap at the end of each year. After all, both you and your customers will evolve. That’s the beauty of customer experience. It’s not defined by a moment in time. It’s a journey filled with opportunities to create micro-moments of trust with consumers. And capitalizing on these moments is the result of thoughtful brand strategy that permeates throughout a healthcare organization.